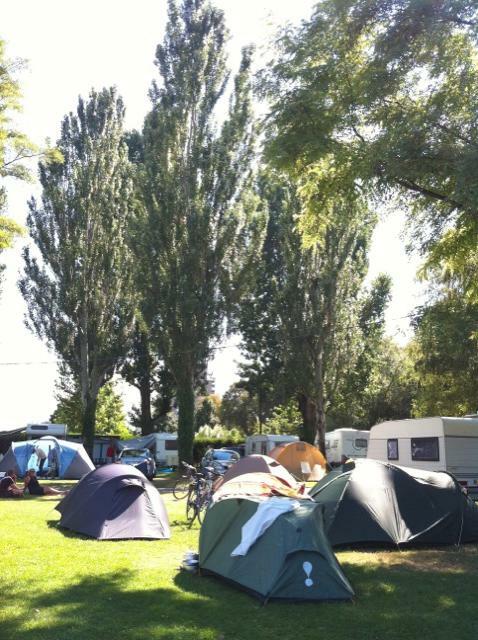 These pictures of campsites with tents and trees and the sun are becoming a bit repetitive aren’t they? Sorry, I’ll try be more imaginative tomorrow night. This afternoon was very much in the style of this morning following, on and off the cycle route of the Rhine, and I saw it! It does exist. In fact I will be camping tonight on the banks of the Rhine at Camping au Petit Port in Huningue in France, but only just as we are within metres of both Germany and Switzerland. Reggie and I will probably head over the frontier tonight to celebrate being Swiss (on behalf of the Swiss of course). Henry will have to stay on the campsite to look after our things. Henry is the tent btw. The campsite is a great little place that you wish existed in every town in the World. Compact & friendly with a nice open area where people who prefer not to spend their holidays in a tin box can pitch their tent (rather than having a whole pitch to myself surrounded by the ghastly white things!). Only thing that is missing is a nice view.